Suppliers of plant to the rail network in Scotland are poised for years of work as two major projects continue to make progress. BAM has just been appointed principal contractor for the £170m upgrade of the Aberdeen-Inverness line while in the south engineers have started installing overhead power cables on the main Edinburgh-Glasgow line in advance of next year’s electrification. Fresh from its recent completion of the £294m Borders Railway, BAM is due to complete the first phase of its new contract in 2019. Over the next four years engineers will double-track 16 miles of line between Aberdeen and Inverurie, build a new station at Forres and straighten the alignment and extend platforms at Insch and Elgin to accommodate longer trains. The contractor will also upgrade signalling systems along the route and install infrastructure to allow new stations to be built at Dalcross and Kintore. Engineers are now carrying out ground investigations, site surveys and vegetation clearance with main construction works due to begin next spring. BAM’s partners on the project include Stobart Rail. 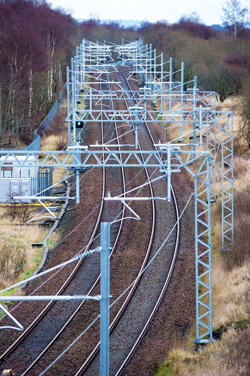 Meanwhile activity on the £742m Edinburgh-Glasgow Improvement Programme (EGIP) over the next six months will see engineers install stanchions to support the overhead lines and then string more than 150km of power cables between the two cities. First sections of cable will go up later this month as the scheme heads towards electrification in 2016. Most of the electrification will be carried out at night but some late evening service alterations will be in place to give engineers more time to complete the complex operations.